In this complex game James uses music, sounds, a true-type font and input by both keyboard and mouse. The player (koala) and the three kinds of enemy have several properties that change during the game. 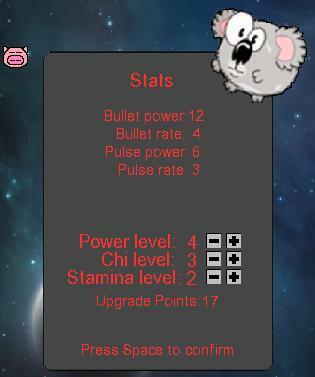 The player's properties include health, level, bullet power, bullet rate, pulse power, pulse rate, chi and stamina. Use the wasd keys to navigate, a click of the left mouse button to fire a directed bullet and the space bar to fire multiple bullets radiating from the koala. The reviewer often saw the Game Over screen at an early stage and resorted to increasing the delay (by editing the code at the end of the program)! You may be able to work out from the code how to play the game well; comments are sparse but the identifiers are generally meaningful. The game is not bug-free but it is fun to play. Download here a zip file containing the main code (koalainspace.txt), the arial true-type font, a folder of images and another folder of sound files. You should unzip the files so that the image and sound folders are in the program folder. In order to run the program you will need to use SDL files and additional libraries. (See Getting Started with SDL for download details of SDL.dll and SDL.pas). James supplied us his program folder, which contained among its files the libraries SDL.dll, SDL_mixer.dll, SDL_ttf.dll, libfreetype-6.dll, smpeg.dll and zlib1.dll. You can put these files in the program folder or with thousands of other libraries in your system folder if they are not already in your system. 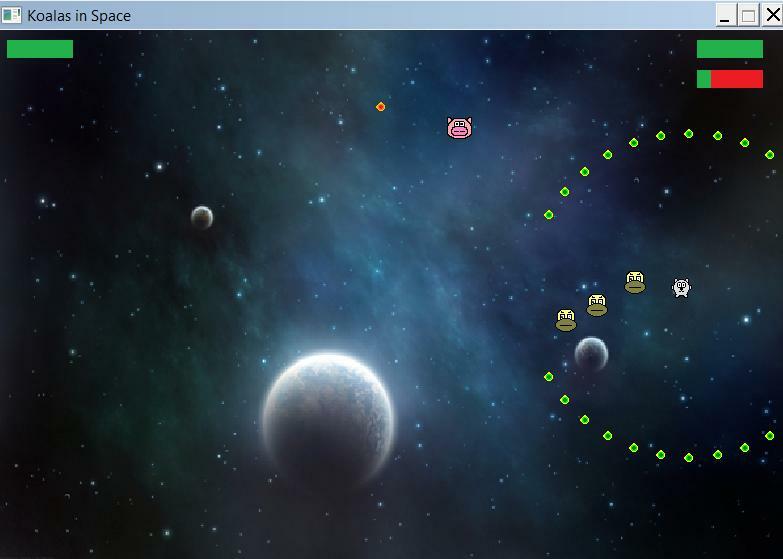 See the introduction to SpaceShooter for individual download details and/or download several at once in a zip file of libraries that are required by the Elysian Pascal game development framework. Could you write your own game using SDL?